I don't know about you but I am getting to the point where I'm abandoning my bright, summer nail polishes and opting for darker, 'non-bright' colors. Despite the fact that the HK weather is not anywhere near 'Fall' temperature, I don't find it odd that I'm pairing burgundy wine colors with my bright Summer attire. Nope, not odd at all. 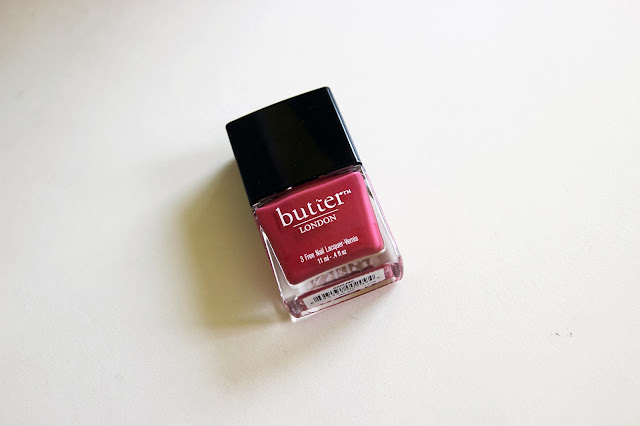 I love Butter London nail polishes - everything is perfect when it comes to color, formula and long-lastingness. The color I'm sporting day is 'Dahling', a beautiful dusty dark red color with that elegant glossiness. Can't fault this brand, nor this color - especially for fall!